My trip to Bath Children’s Literature Festival is starting to feel like a warm-up now! Last weekend I did two author events and, in the week, I did two school visits. It’s lovely to see all different parts of the country though, and to be made so welcome in them. Our first stop was Hereford Waterstones. Hereford Waterstones set out a lovely display of Isadora Moon books for me. I just finished it off with my kitchen set! Hereford Waterstones actually held their own Isadora Moon activity week back in August. Unfortunately, I wasn’t able to attend, but I hear they did wand-making and other activities. As they had been so supportive of Isadora Moon already, it was lovely to be able to go visit them. Some of the children dressed up, including this girl in an excellent witch costume. You can’t see it in this photo, but she had all pink and black stars painted across her forehead. When we first started setting up, the children’s section was fairly quiet. It was, after all, a beautiful October Saturday, warm enough for t-shirts. Suddenly, about five minutes before the event’s start time, we turned around to see an orderly queue of parents and children waiting expectantly. The staff had clearly put in a lot of work promoting the event! We soon broke up the orderly queue by inviting the children to the crafting table. There was plenty of space in the children’s section for some to do craft activities while others came to have books signed and others looked at the 3D illustration kitchen. Luckily, we didn’t have to drive the full three hours home straight after Hereford Waterstones. 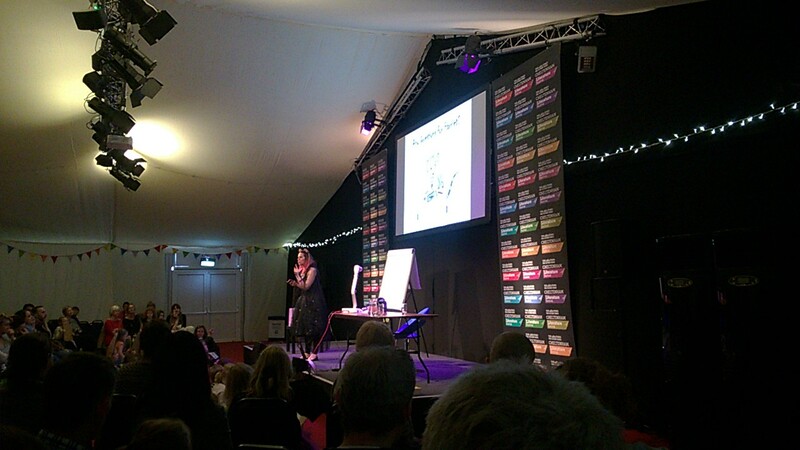 On Sunday I had an event at the Cheltenham Literature Festival, so we only had to drive an-hour-and-a-bit. We were tired and hungry by this point, and I was fighting off a cold and sore throat, but we perked up when we saw the lovely hotel we would be staying in. They had this black-and-white tiled floor in the reception area, just like in Isadora’s kitchen. I probably looked really vain swooshing around in my cape for photos, but it was too good a setting not get a few snaps of my slightly-tweaked new costume. Annoyingly, we left my SLR camera at home by accident, so we had to rely on Henry’s phone camera. That’s why the quality in these photos isn’t as high as I would like. I couldn’t resist a spot of posing in my event costume on the black-and-white floor. The festival was huge, as it was not just children’s literature, and the venue I was in was bigger than any I’ve been in before. Another child asked if I had any children of my own. I said I had a daughter who was here today. Henry raised up Celestine in the audience and everyone looked round at her, which was a nice, spontaneous moment. I also had the chance to share that one of her middle names is Honeyblossom, just like Isadora Moon’s baby sister. If you would like to see me at an event, check out my events page for my schedule. We drove back on Sunday, after the Cheltenham event. On Monday I had a meeting in London with Oxford University Press (exciting Isadora Moon news coming from that soon! ), then on Tuesday Henry and I were off to Essex for a couple of school visits. These were arranged by Just Imagine, who sell book packs to schools and organise author visits. Check out their website here. Here I am setting up for my first school visit of the day. In the afternoon we visited Howbridge Infant School. They had a couple of Isadora Moon standees on display. I knew about these already, but it was my first time seeing one in real life. I love them! At the school, we looked at how to draw a couple of Isadora Moon characters and then we created our own hybrid character and a story to go with him. Both events were great, and I’m hoping to get a few more pictures off the schools to add to the blog. You can visit my schools page if you’d like to find out more about the school visits I do. So that was the last week in my life and the ‘Isadora Moon Autumn Tour’! In between all this whizzing around the country, I’ve started work on illustrating Isadora Moon Book 7. I think I’ve mentioned it before, but Oxford University Press and I are doing a cover reveal for the book on October 30th at 10am. Look out for that on Facebook and Twitter! And if you haven’t seen it already, I’m running a giveaway until 6th November for the best Isadora Moon Halloween costumes. You can see the full details on my Facebook page.